We’ve taken business empowerment a step further by integrating Salesƒorce access within our solution to deliver increased customer satisfaction and reduced incident/ticket close time. Zappix, a smartphone Visual IVR software innovator, has integrated Salesforceֿ access within its cloud-based contact center software suite. Zappix users may now directly access information available via Salesƒorce Service Cloud® and Salesƒorce Desk while also leveraging expanded functionality such as CRM integration, self-service support tickets and sales-lead collection. “Now, Zappix-supported contact and call centers can continue to take advantage of our visual IVR platform’s easy-to-use interface and convenient omni-channel experience; but those that subscribe to Salesƒorce Service Cloud may now also offer an enhanced customer experience because of our integration into the CRM system. And that gives agents direct access to the full customer journey and Visual IVR inputs, as well as seamless and accurate data transfer, which reduces cost and time.” said Zappix Chairman Avner Schneur. Compatible with leading contact center platforms, Zappix empowers the customer service function across any web, Android, iPhone or Apple Watch Visual IVR channel. Contact center and customer service representatives can nimbly respond to business changes by deploying simultaneously on all platforms in near real time. Zappix tracks all consumer interactions on the platform and provides users data on their consumers’ interaction with voice channel, social media or self-service options, thereby allowing analysis of cross-channel consumer behavior, trend identification and consumer satisfaction measurement. 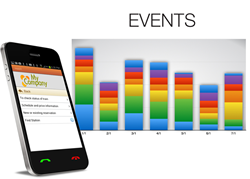 Cloud-based Zappix Visual IVR is a Software as a Service (SaaS) solution for web or cross-platform mobile apps. Offering omni-channel, customer service communications, Zappix enables businesses to rapidly deploy a highly intuitive, extremely interactive smartphone visual IVR app to improve customer care, reduce contact center costs and increase Net Promoter Scores™. Fast-growing Zappix currently provides hundreds of contact centers with a streamlined way to empower and better serve customers. Supported organizations include insurance companies, utilities, banks, internet and mobile service providers, retailers, airlines and government agencies.